Have your phone calls go to voicemail during your uninterrupted time. Have your voicemail message articulate clearly the best times to reach you by phone and be sure to include your email address in your message as an alternative way to reach you. Colleagues and customers often express themselves more clearly in email, which in turn allows you to more effectively respond to them – and, to do so in a timely manner. 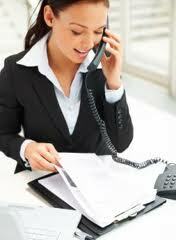 When speaking on the phone, you can politely and professionally establish a time limit when necessary. For example, you can say, “Joe, I’ve only got 5 minutes, but I definitely wanted to get you the information that you called about.” This is probably not for each and every person you talk to but it could certainly be used with some colleagues and professional contacts.